I was lamenting the fact (I lament a lot!) that I never celebrate Australia Day. I never feel that nationalistic pride that makes me want to do something special. And then I read this on Facebook. I'm a damn good Aussie after all. And it's not really Stray'an to celebrate Australia Day anyway, is it? 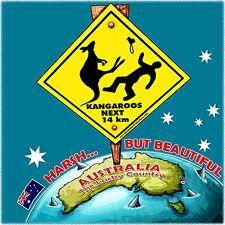 So anyhow...have a read, a chuckle...and ava good Australia Day! * Beetroot with your hamburger...of course. * You know that there is a universal place called "woop woop" located in the middle of nowhere...no matter where you actually are. Is Australia Day really Australia Day without Sam Kekovich? PS I just remembered I don't like pav...or lamingtons! Perhaps I'm not a damn good Aussie...??? Happy Astraya Day to you too. Don't like pav?? That's okay, I'll have your share :) Aussie, Aussie, Aussie, Oi, Oi, Oi ! !